There are lots of reasons to call professional tree fellers. You may require tree felling because of safety concerns, root proximity to a building, storm damage or to prevent the spread of a tree disease. Maybe the tree is blocking light into a property or the species is wrong for its position. It could be however that the whole tree need not be cut down. A damaged tree can sometimes be saved with careful pruning and limb reduction and we will offer our free advice once we visit your site. But whatever the course of action, site safety is assured. If a tree cannot be felled in its entirety we will cut it down sectionally using ropes and pulleys. This allows the operators to carefully lower selected sections of the tree to the ground minimising any possibility of damage to nearby property. Plus at Tree Profiles Ltd our tree felling service is carried out by fully qualified arborists/tree surgeons. Each arborist has their own NPTC appropriate certification and all of our climbing and lowering equipment is in accordance with the very latest Safety Regulations. We also guarantee that all of the debris from the old tree will be removed and your site left clean and tidy. Leave it to the tree felling professionals. 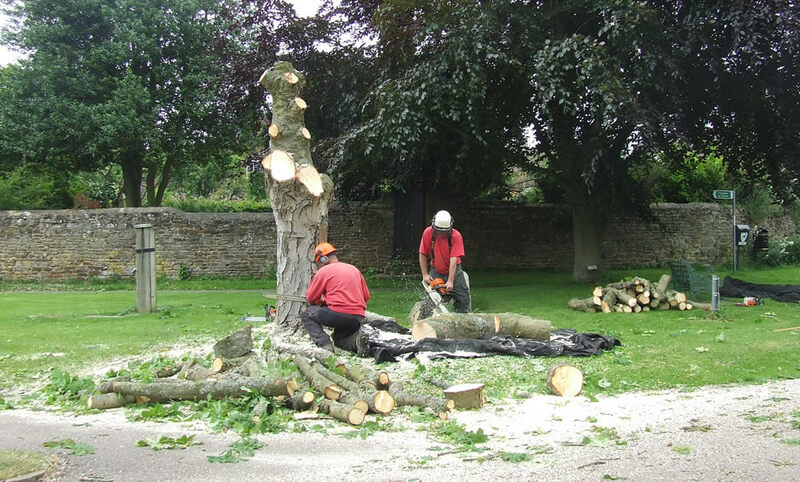 We carry out our expert tree felling and tree cutting for commercial and domestic clients in Northamptonshire, Buckinghamshire, Oxfordshire and Warwickshire. Tree Profiles Ltd is a member of the Arboricultural Association, approved by Trading Standards and a member of Buy with Confidence scheme.